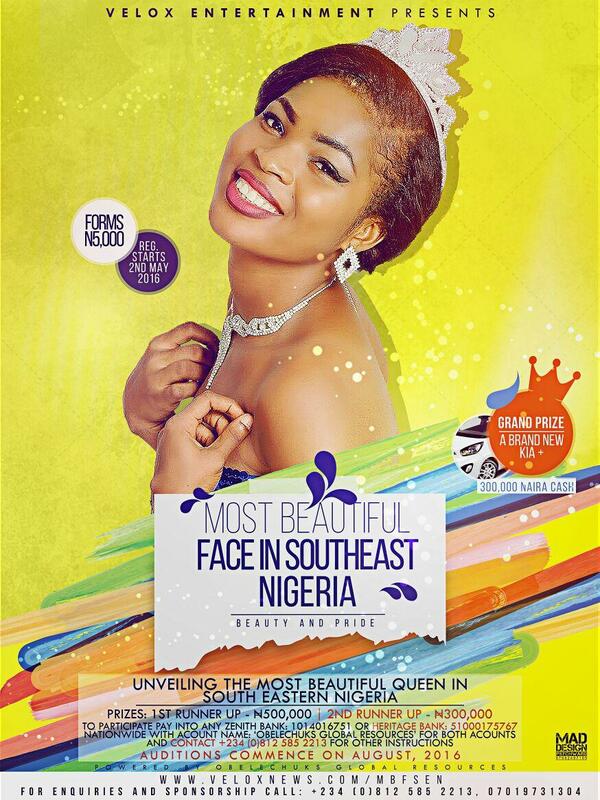 We introduce to you THE MOST BEAUTIFUL FACE IN SOUTH EAST NIGERIA "Beauty with Pride" under the auspices of Velox Entertainment. The MBFSEN is a platform designed by Obele-Chuks Global Resources to promote the virtues of womanhood with the emphasis on Beauty, Woman Pride, Leadership, Entrepreneurship and Philanthropy to the society. The MBFSEN pageant will be contested by ladies (age 17-26) who have been put to test, trained and groomed by capable hands and motivational individuals in and outside Nigeria. This pageant provides a platform for ladies to serve humanity and Empower communities in South East, Nigeria and around the world thus allowing our outstanding daughters the rare opportunity to display their the Winner will be crowned on the last day of the camping which is GRAND FINALE. JOIN THE SET OF TALENTED EXQUISITE LADIES.